Not many art exhibitions allow visitors to touch the art. 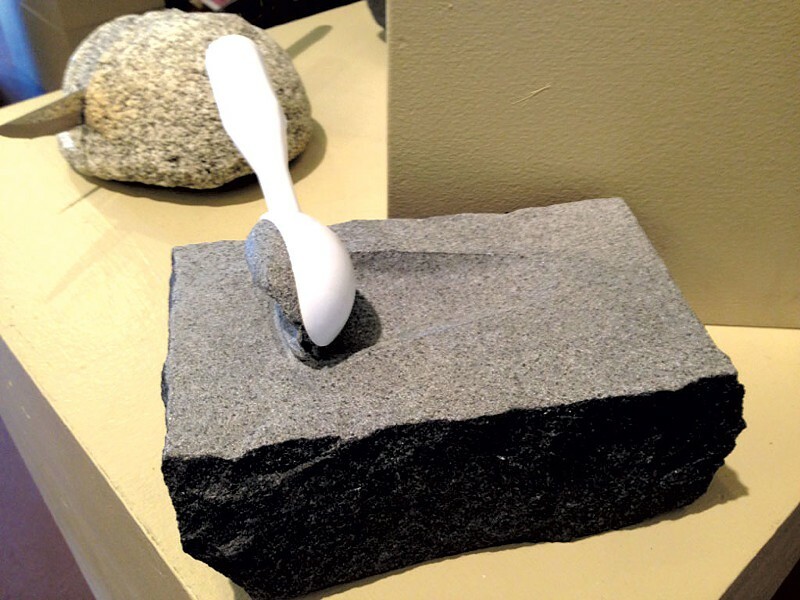 "Rock Solid In & Out," the 14th annual exhibition of stone sculpture at Barre nonprofit Studio Place Arts, not only allows touching but invites it. Among the pieces crafted from marble, granite, limestone and river rock are smooth, pod-like shapes at hand height, a dog's intricately carved fur and a gallon-sized hunk of granite with an ice-cream scoop stuck in it. Small wonder, then, that stone sculptors seem to be in awe of their raw material. Many of the show's pieces leave the stone unfinished or rough-cut, or are shaped to show off its beauty marks. 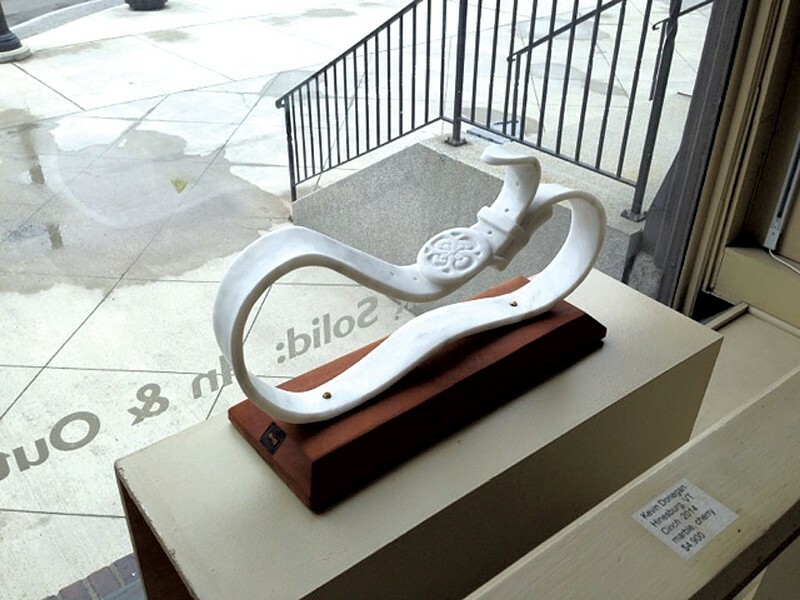 "Acid Rain," carved by Sophie Bettmann-Kerson of Worcester, is a curvy, symmetrical abstract alabaster piece, suggestive of a female torso, whose dominant feature is a wide streak of rusty orange down its middle. The work invites myriad interpretations — perhaps, for instance, it represents both woman and nature as somehow damaged — but the sculptor clearly found the irregularity beautiful. Kevin Donegan, a Hinesburg sculptor who contributed three pieces to the show, makes the same point more obviously with "Marble Is My Cathedral." The piece is composed of two blocks of marble with sloped tops positioned together to form a high-roofed structure. The slabs have a found-object quality; remnants of white paint are visible on the inner surface of each. Donegan juxtaposes this roughness with exquisitely carved details, such as a small opening on one slab shaped like an arched door, its shadowed interior revealing a large keyhole. Donegan can also do highly finished pieces, including the one placed in the gallery's window beneath the exhibit title. Called "Cinch," it's an oversize, lifelike man's belt in marble, buckled around a waist-shaped void and positioned on its back, on a cherry platform. Carving such a thin, airy piece is anything but a "cinch," despite its wink of a title. Less daring but equally polished is "Vermont Spring," by Stowe sculptor Jim Santos. The small, rectangular, tablet-shaped piece, balanced upright on one corner, shows off the dark, variegated greens of its medium: Guatemalan serpentine marble. Most of the other works' raw materials are locally sourced. Matt Larson's photographs of the sheer rock faces of Mt. Mansfield and Smugglers' Notch, which the Waterbury Center photographer developed in vintage Van Dyke brown, remind viewers that the sculptors' mediums are the Vermont landscape. Indeed, the state's two major centers of stone quarrying and sculpting — West Rutland for marble, Barre for granite — have defined much of its cultural history. "Rock Solid" provides one of few opportunities to admire the strengths of both continuing traditions in one room. Larson's framed photos are among several two-dimensional works complementing the sculpture show. In John Douglas' computer-generated images, round river rocks seem to float in the air. They echo a similarly gravity-defying arrangement of rounded river rocks that sculptor Gampo Wickenheiser attached with pins and glue to three leg-like posts made from rusted industrial rail. The Barre native calls his creation "Becoming." B. Amore, founder of the Carving Studio & Sculpture Center in West Rutland, contributed a framed assemblage consisting of a crowd of faces, each printed on a separate square of silk, surrounding a flat hunk of verde antique. The green marble is inscribed with "Do what is the heart of the matter" in metallic-gold marker. Across the room, Plainfield sculptor Heather Ritchie seems to have followed that directive with her highly personal assemblage "Family Portrait." It consists of two marble phallic or mushroom-like figures and two plastic toy fawns grouped together on a crocheted doily. One of the marble "parent" figures is appliquéd, a technique Higby says is entirely new in her experience of stone sculpture. Though Ritchie's piece wouldn't survive the weather, most of the show's sculptures would. The name of this year's exhibit, "In & Out," is meant to highlight that durability, as well as remind viewers to step outside and see Barre's growing collection of public art in its native material. Higby's nifty map to eight granite sculptures in town includes a handful grouped around SPA, such as Ritchie's "Coffee Break," an award-winning tribute to Barre's blue-collar Italian carvers. One new piece not yet listed on the map lies at the foot of the stairs to SPA: "Crash" is a triangular granite slab with a series of gouges and etchings, including one of a teddy bear, in its polished surface. The piece is Washington, Vt.-based memorial etcher Sofia Shatkivska's vision of the Ukraine site where the Malaysia Airlines plane was shot down in July. The memorial will long outlast the actual crash site's landscape, just as the works displayed in "Rock Solid" will, if handled correctly, outlast generations to come. Meanwhile, though, they're only on view here until November 1. The original print version of this article was headlined "Made to Last"